Glenview comfortably sleeps 4 guests in 3 bedrooms - two doubles and a single. Clisham lounge – sun-room, conservatory, flooded with light, endowed with amazing views and equipped besides (for your comfort) with idiot-proof blinds is a zone of tranquility and piece. It’s at once your dining-room and comfortably furnished with a two seater sofa and two inviting armchairs, all re-cliners in the softest leather for quiet reading, meditation, and scribbling off your postcards to the folks back home. Completed only in 2013 and to high specification, this charming sunroom, modeled on Edwardian lines, was sourced locally and built by respected island tradesmen. And it benefits from underfloor heating (there’s central-heating, by ample wall-mounted radiators, everywhere else in this home from home) beneath that immaculate engineered-oak flooring. The Snug’s a cosy, intimate space and the main entertainment area, leaving others to read that novel in Clisham Lounge and in entire peace. And six discreet double-power points are there for the necessary technology – the 22-inch screen digital LCD television, for instance, with Sky TV satellite connection; the broadband-router (there’s full BT Broadband wi-fi throughout Glenview)… or, if you’re in the mood for music or Radio 4, there’s the Sony mini-hifi with CD player, DAB digital radio (all the BBC digital radio channels are available on Lewis) and even an iPod docking-station built in. But The Snug’s a social room too, as you repose on the 2 Sherlock chairs with matching footstool, or admire the simple lines of the elegant oak furniture. And, at its focus, is the multifuel Charnwood stove in sturdy cast iron for those cool northern nights… it burns peat, logs or coal, and we’ve left you abundant supplies of them. Your kitchen at Glenview is a space at once inviting and practical, in open-plan relation to The Snug and benefitting, too, from the heat of your peat fire in that Charnwood stove. And it’s equipped in every way for your snacks and cuppas, breakfasts and meals. There are stylish hi-gloss black fitted floor and wall units, of contemporary fashion and with stainless steel detail. And the integrated appliances include a 12-place setting HJA dishwasher, a 1200 rpm washing-machine and a spacious, integrated fridge-freezer. There’s a neat round inset sink for the preparation of vegetables and so on; a large under-worktop electric fan-oven (including overhead grill); a 4-ring electric hob in brushed stainless steel… everything you need to make tonight’s dinner. And, of course, we’ve left you a riot of utensils and you’ll find the kitchen fully stocked with Denby tableware, crockery, glassware and cutlery. Step outside the back door, and you’ll find your drying-green – actually, on a sweep of smooth, glaciated Lewisian gneiss, one of the oldest rocks in the world! – and a sheltered area where you might choose to enjoy a barbecue. Attention to detail is everywhere evident in this room, from the stylish Travertine wall-tiles to your heated towel-rail. Siabost is a beautiful en-suite chamber of rest, beautifully decorated and with the softest and most inviting comforts. There’s solid pine bedroom furniture, its central glory being the elegant double sleigh-bed, swathed in costly Sanderson bed-linen in duck-egg blue. That delicate shade’s continued in the brocade window-drapes with cream detail, backed – for those light midsummer nights – by simple Roman blackout blinds. There’s ample shelf and hanging storage and (like all the bedrooms) Siabost is equipped with a bedside lamp with matching wall lights, a radio-alarm and a hairdryer; there are three double power-points. And, when you rise, there’s a splendid downhill outlook through the window over the heart of the village and to the shimmering western sky. Your immaculately designed en-suite bathroom has Roca white sanitary fittings, smart and understated against the Travertine wall-tiles. There’s a powerful Briton walk-in shower in stylish Optima cabinet and the room’s kept airy with a Philips extraction fan… hotel-style facilities in Hebridean comfort. Calanais is a charming bedchamber with pine furnishings, including the smooth solidity of your sleigh-bed and a neat dressing-table and chair. You’ll drift away to sleep amidst the white Sheridan 400-threadcount silky-soft linen, draped with a royal-blue and turquoise throw. The wardrobe has ample hanging space and overhead storage for all your garments and there’s an additional corner in Calanais for your luggage. There are two double power-points, two matching wall light to the bedside lamp, a hairdryer and radio-alarm are provided, and of a morning there’s a sheltered, eastward outlook through the window over the heathered hillside. 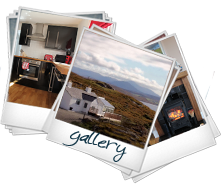 Dail Mor is a cosy, comfortable single room maximizing the flexibility of your accommodation at Glenview. There’s a single pine sleigh bed with superlatively soft 400-threadcount Sheridan linen in palest striped cream, set off with pretty aquamarine throw and bolsters. There’s a bedside cabinet and two double-powerpoints for your convenience and, besides, a radio-alarm and electric hairdryer – and a wardrobe with appropriate hanging-space and shelved storage.